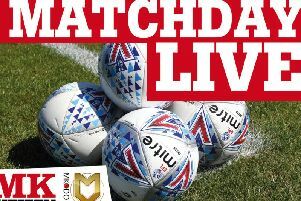 Chuks Aneke struck with seven minutes to go to secure a point as MK Dons drew 1-1 with Stevenage on Saturday to climb back into the automatic promotion spots. Ilias Chair scored from fully 30-yards to open the scoring for the visitors after half an hour, as injuries would rule the day for Dons, with David Wheeler and Baily Cargill limping out early. With promotion rivals Bury, Mansfield and Lincoln not playing, Dons climb back into the top three but have played a game more. After suffering their defeat in six outings on Tuesday night, Paul Tisdale made four changes to the team with notably inclusions. Having dropped Lee Nicholls for six games, the keeper was reintroduced to the fray at the expense of Stuart Moore. And having complained of his lack of defensive options earlier in the week, Mathieu Baudry and Cargill were bandaged up brought back into the side too, while Kieran Agard's brace in midweek saw him regain his starting berth. Having started alongside David Wheeler initially, Agard was joined by Aneke after just 20 minutes when the QPR loanee suffered a facial injury early on. In a game with barely any chances, Dons had played well until then, but found themselves trailing on the half hour mark for the third time in a week. Having scored from 60 yards in midweek, Ilias Chair chanced his arm again from half that distance after Dons only half cleared a Stevenage corner, but the outcome was the same as it flew past Nicholls, who should have done better. With barely any chances of note in the opening half, Conor McGrandles was brought on at the interval at the expense of Baudry as Dons switched to a flat back four with a busier midfield in a bid to match the visitors man for man. And it almost paid off within 10 minutes of the restart from the unlikely source of Russell Martin, who fired in from the edge of the box, only to be denied by a fine Farman save, tipping the ball onto the bar. The inclusion of Baudry and Cargill were supposed to alleviate the defensive woes for Tisdale, but Cargill left the field on a stretcher shortly before the hour mark to once again call on Jordan Houghton to fill in at the back as Robbie Simpson came on up front. Dons again tested the framework when McGrandles' free kick clipped the outside of the upright but all too often their final ball lacked, allowing Stevenage off the hook. Chances still came though. Aneke saw a strike bravely blocked by Ben Nugent and Jake Hesketh fired just wide while Agard, who had scored five in his previous four games, somehow headed over from a yard out after Alex Gilbey's near-post flick. With Stevenage causing little issue at the other end, Dons' persistence finally paid off with six minutes to go when Aneke tapped home Gilbey's neat ball into the six yard box to share the spoils.